If you've been keeping up with my blogs (and why anyone would is beyond me) then you might have noticed that it has been a week since my last cycling-related blog. This doesn't mean that I went for a ride and failed to write about it – I actually took a week off, because I really needed to do so. 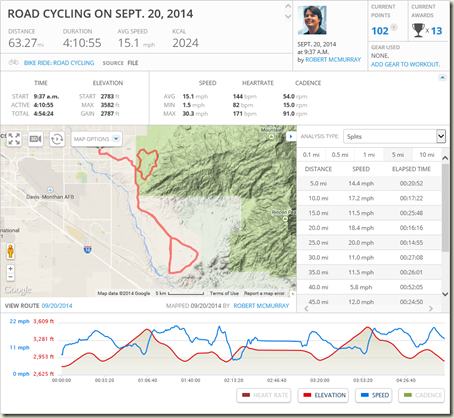 Let me explain – I switched to a new road bike, and after my ride on September 20th, my hands and wrists were really hurting. I discussed my situation in detail in the blog that I wrote after that ride, but the pain persisted for several days. I knew that I could do permanent damage if I kept riding, so I took several days off to recover, and I took my bike back to the shop for another fitting. After several days of ibuprofen and ice packs, I was ready to try again on my regular 17-mile course from my house through Saguaro National Park and home again. All of that being said, my hands hurt a little bit after this ride, but the pain was nowhere near where it was the other day. Overall this was a good ride – my time was slightly slower than my personal best, but not by much, and it was a perfectly acceptable ride after taking a week off. I rode part of the way around Saguaro National Park with another cyclist, but that wasn't a planned event – I arrived at the park just before the other cyclist, and he queued up behind me while I was showing my annual pass and ID to the park ranger who was on duty (who knows my as one of his frequent fliers). I took a few seconds to store my things in my riding bags, which gave the other cyclist time to pass me at the park entrance. Once I started around the park, I appeared to be riding at his pace even though he was clearly a stronger rider, so I simply let him keep the pace for both of us. However, he got stuck behind a slow-moving vehicle, and I don't wait for those – I just pass them when there's room. So I called out that I was passing him on the left, and I humorously remarked "Ugh – Tourists" with an air of feigned contempt as I passed the other cyclist. After I passed the car, I was on my own until I reached the large hill on Riparian Ridge around the backside of the park. I'm climbing the hill better than I used to, but the other cyclist managed to catch up to me over the 1.5 miles to the high point of the ridge. As he drew up next to me, I humorously quipped that I hate that hill. He agreed, but he said that he liked using that hill to work on his hill climbing skills. (Which is what I'm doing, of course.) Just to make sure that he didn't get the wrong idea about me, I pointed out that I was only joking when I made my earlier comment about the tourists since the park is actually for the tourists, and he laughed. We rode side-by-side for the next mile or so and talked about cycling in Tucson, then I pulled behind him so we could ride through the wash before Javelina Rocks (which I wouldn't want to try next to another cyclist). That being said, he rode through the wash at a much greater speed than I felt comfortable to ride, so I fell behind him by a couple of hundred feet, and we extended the gap between us when we went through the next wash. I tried my best to keep his pace apart from riding through the washes, but we didn't line up again for the rest of the ride. Nevertheless, I made it home in just over an hour, so I have yet to meet my goal of breaking the one-hour mark for the ride. One last item of note – I mentioned in a previous blog that I'm trying to figure out the best way to have a mirror on my new bicycle. I really need to see the traffic around me, but the mirror that I used on my hybrid's handlebars doesn't appear like it's going to work for my road bike's drop-style handlebars. With that in mind, I tried out a helmet-mounted mirror on today's ride. OH – MY – GOSH. That was a terrible experience. 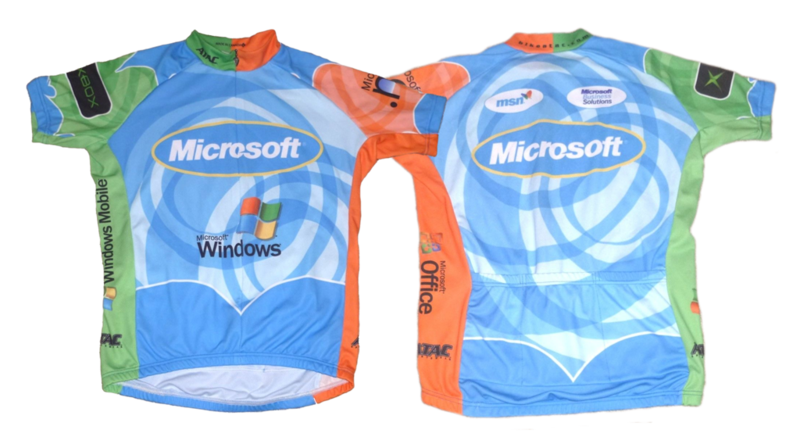 I tried very hard to adjust to it, but I thoroughly hated everything about it, so I ripped it off my helmet within the first three miles of the ride. Ugh. I have to admit, I had never heard of the PJ Media website before, and at first glance it appears to pretty right-leaning from a political perspective. With that in mind, I expected the article to be someone's paranoid and sensationalistic tirade about left-leaning environmentalists. But that wasn't the case; the article was full of real-world examples of just how stupid some people can be. Before I go any further, I have to confess that I am pro-environment. I think that our current society is ignoring the irrevocable damage that it is causing, and most people are simply turning a blind eye to the situation because they think that disregarding the problem will not have any negative impact during their lifetime. That simply isn't true. The wanton destruction of vast portions of the globe in the last few decades has shown us that a few years of greed and neglect can cause irreparable harm to the environment. However, I also believe that our efforts must be tempered with common sense and actual scientific evidence to back up our actions. I do not ascribe to fear mongers on either side of an environmental argument; I want facts, not opinions. And when the facts do not support a hypothesis, I do not believe that "The Ends Will Justify The Means," so it is not acceptable to tell a lie in the hopes that the future will eventually prove you to be correct. So - what does all of this have to do with Communism? In the original article, the author attends a large Climate Change Rally in California, and he is shocked that the prevailing message is to overthrow the current government of the United States and supplant the existing political system with Communism. The justification for this hardline approach is the theory that capitalism is the single-greatest cause of environmental damage, and if we simply switched to Communism then the world would evolve into a blissful, global utopia. And this is where I am obliged to interject - once again - that these people are morons. I was living in Germany in 1989 when the years of Communist rule had finally brought the Eastern Bloc nations to the point of collapse, and the people in power were forced to open their borders to the West by millions of people who took the streets in unanimous protest against Communism. (An important lesson here is that millions of people who were forced to live under Communist rule rose up and overthrew their oppressors, whereas the article that I listed in the beginning of this blog illustrates the actions of a few hundred misguided people who somehow think that adopting a political system which everyone else opposes will somehow make their lives better. The word "ludicrous" comes to mind.) In any event, once the borders were opened, we were finally able to enter countries of Eastern Europe which had been closed to the West due to decades of Communist imprisonment and isolationism. What we saw was appalling - the Communists had trashed the environment beyond what the west could have surmised, and the damage was so great that I heard one prominent political figure from West Germany declare that it would be better to simply bulldoze all of East Germany into the sea rather than attempt to clean it up. Across the country the water was heavily polluted, acid rain from coal plants was destroying the forests, and most of the cities suffered from horrible pollution due to a complete lack of emissions filtering for transportation and power stations. However, the actions of Eastern European Communists are not isolated incidents; one need only look at Communist China for a myriad of environmental atrocities. Moreover, the perpetual damage to Russian resources like Lake Baikal, Lake Ladoga, and the Aral Sea by the former Soviet Union cannot be undone. Communism does not breed environmental awareness; it completely ignores the environment. Forasmuch as California's Communists would try to urge everyone to rise up and overthrow their government in the name of environmentalism, those same fools are fighting a system that has done more for the environment than almost any country in history by regulating pollution, creating National Parks to preserve millions of acres of pristine wilderness, and countless other deliberate actions. Could the United States do more to protect the environment? Yes, it could. We should be doing a lot more to help cut down on pollution, to use our existing resources wisely, to cut our dependency on foreign oil, and to research alternative methods for creating energy. Is the political system of the United States free from corruption? Of course not. Any system is a by-product of its individual parts, and we have way too many people whose actions are more about personal gain than about caring for the rights and property of the people and environment which they are sworn to represent. Is Capitalism free from corruption? Certainly not. The old Biblical adage that "the love of money is the root of all evil" is an apropos observation for much of the Capitalist world. Where there is money to be made, people will often chase after ever-elusive profits while ignoring the consequences of their actions. This leads to environmental disasters, and it leads to economic meltdowns like the Great Depression of the 1930s or the more-recent 2008 Recession. Capitalism has enabled people in power to drive multi-billion-dollar corporations into the ground, leaving thousands of their loyal employees out-of-work with no retirement savings, while the people who caused such debacles walk away with multi-million-dollar severance packages. These scenarios are also atrocities which should never happen again, although they are somewhat outside the scope of this blog. In any event - in a free society, we are not powerless to act when see wrongs being committed; we have the freedom to do something about it. We can write about it, we can march in protest, we can push for legislation to make things better, etc. In a closed society (like Communism) you do not have the freedom to do anything about it. The Communist system controls every part of your life, and any form of dissention will be quickly suppressed. With that in mind, I reiterate my earlier claim that anyone who suggests overthrowing our current system of government and adopting Communism in order to save the environment is a blithering idiot. But that being said, today's ride was a little different in one import aspect – it was the last official day of Summer, and I knew that I was within a few miles of reaching the 1,000-mile point for the season. With that in mind, after I finished all of my commute riding, I switched into shorts and a t-shirt and I road a quick 7.7-miles along the Rillito River Park to put my mileage over the top. The first pass around PHRL was not that bad; the new bike definitely helps with the hill climbing, and switching from toe clips to cleats has helped tremendously as well. (No more toe pain, and more climbing power.) 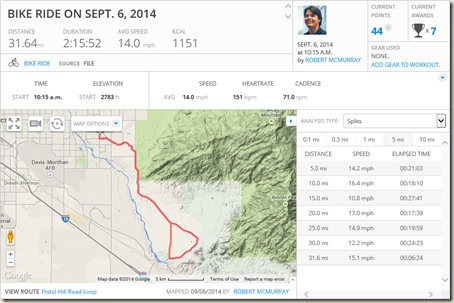 In fact, I completed this 63-mile ride on my new road bike in 28 minutes less than my last ride on my hybrid bike. However – not everything about this was great. My new cycling gloves were too small, so that put undo pressure on the skin in between my fingers, so my fingers were seriously hurting by the mid-way point. But even more alarming was the fact that the pinky fingers on each had were starting to go numb during the ride, which is a sure sign that something major is going wrong. This could have been caused by the too-small gloves, or my hand positioning on the handlebars (even though I changed positions a lot in order to avoid this scenario), or it could be that the road is quite bumpy and I am used to my hybrid which has front shocks and fatter tires to absorb more of the road jarring, or it could be that my bike was not set up correctly when I purchased it so I was leaning too far forward and thereby putting too much pressure on my hands. It could have been any one of those reasons, or all of them. In any event, my hands were a sorry combination of pain and numbness by the end of the ride. I took a bit of a break about the mid-way point to have lunch at the hydration station near the entrance to SNP. Since I have been routinely burning off everything that I have eaten before my long rides, I brought a Clif bar with me to eat. (Clif bars hold up well to the abuse of being stuffed in a cycling bag.) While I was eating, two cyclists dropped by, and I knew one of them from having met him at this same spot during one of my earlier rides. The three of us chatted about cycling for a while, and the two of them tried to dissuade me from riding the PHRL since there are so many inattentive drivers hitting cyclists these days. I thanked them for their concern, but bad drivers are simply a fact of life these days and we can't hide from them. Also, the Rincon Valley Farmer's Market was having their annual Chili Festival today, so that was a busy place. There are usually a couple dozen cars parked at the market as I ride by, but today there was closer to a hundred or so, with live music playing and the police slowing traffic at either end of the stretch of road where the market is located. It probably would have been great to have stopped and looked around, but I had too many miles to ride. This was my second day of riding with my new road bicycle, and I'm still getting used to the differences. With that in mind, I'm building up my confidence, but I'm not going as fast in some places as I used to ride on my old hybrid. However, even though I was taking it easy on the faster parts of my ride, I was able to pick up the pace on the slower parts of the ride due to the design of the new bicycle, which resulted in another day of personal bests. I completed the full 17-mile ride from my house through the Saguaro National Park (SNP) and back in just over an hour, which is considerably better than my earlier rides. (I completed my first ride around the park this past April with a time of 1:26:49, and today's ride had a time of 1:03:11.) A goal that I have been working towards is completing the ride in under an hour, and as of today I am a little over 3 minutes away from accomplishing that goal. It was supposed to rain in the evening, so I chose to ride during my lunch hour. Riding at that time has an added benefit of fewer cars on the road and less cyclists. That being said, I need to look into picking up a better mirror for the new bike. I'm using the end-of-handlebar mirror from my previous bike, and that doesn't look like it's going to work with the drop-style handlebars on my new bike. I simply can't see the cars behind me, and that's a bad thing. It's amazing how much of a difference changing some of your gear can have. 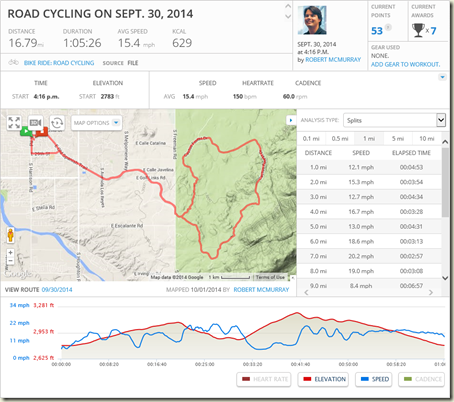 If you read my blog from last Saturday, I mentioned that my feet were hurting during many of my long rides. I have known for some time that switching to cleats would be better than my existing configuration where I had been using toe clips for the past few years. 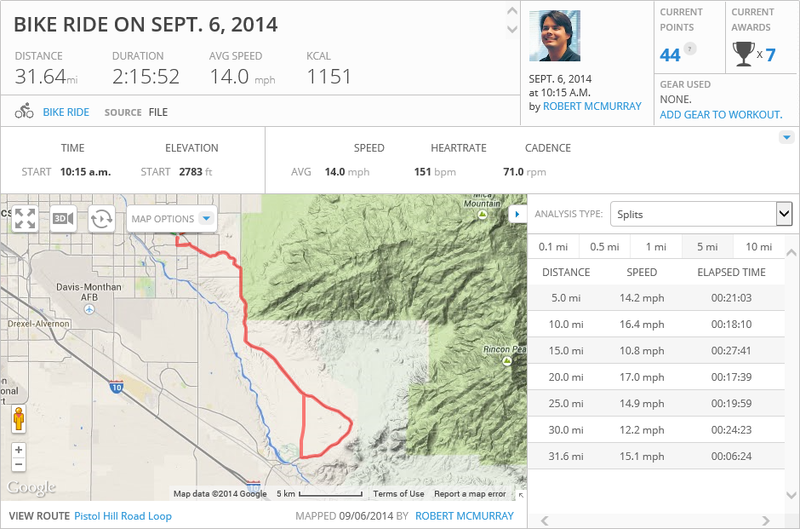 Until recently all of my rides had been fairly short – 10 miles or less. But sometime this past Spring I decided to slowly increase my mileage, and by the end of Summer I was riding over 100 miles per week. As I did so, I occasionally made some upgrades to my existing bike, but I was still riding a hybrid – which isn't the best bike for hill climbing or long-distance road riding. With that in mind, I worked it into our budget to replace my hybrid with a dedicated road bike, and I switched from toe clips to cleats. 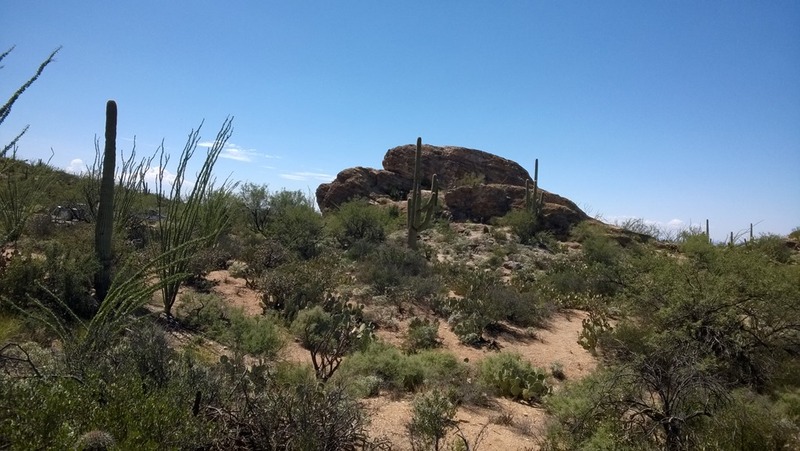 Today was my inaugural ride with my new road bike, and I chose to ride my usual 17-mile course from my house through the Saguaro National Park (SNP) and home again. I'm still building up my confidence on the bike, so it seemed as though I was riding slower than I would normally ride while I got used to the feel and controls of the new bike. But that being said, I still managed to complete the SNP loop 2¾ minutes faster than my previous personal best. I attribute the increased speed around the SNP loop to two primary factors: my new road bike is 12 pounds lighter than my hybrid bike, and switching from toe clips to cleats. 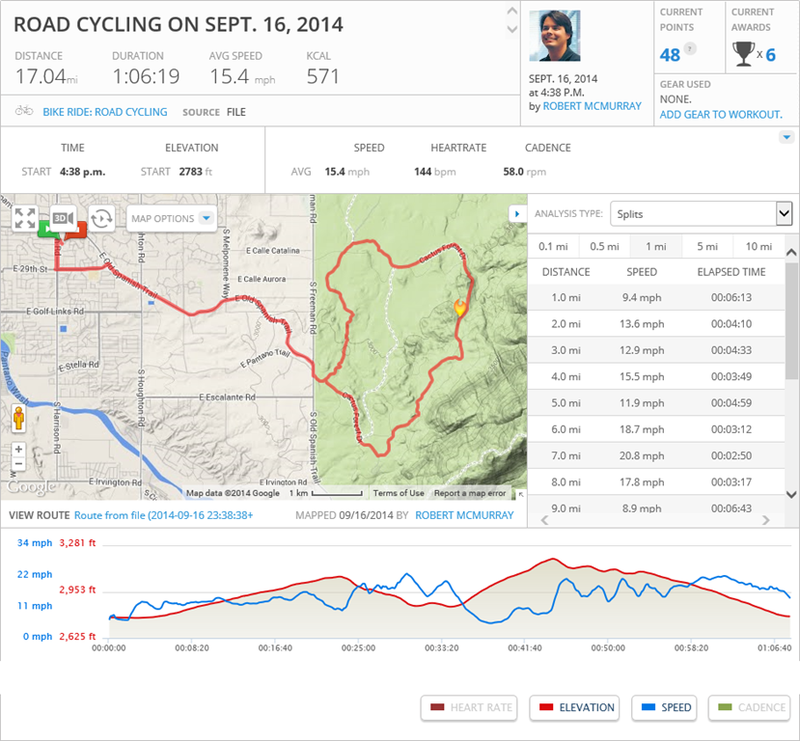 Both of these changes gave me increased climbing power, and as I get more comfortable on the new bike I would expect my hill climbing to improve a little more. The only downside of my new bicycling setup is – I have been very spoiled with regard to road dampening. My hybrid has much larger tires, which absorb more of the bumps in the road that I encounter on my rides, and whenever the road grew too bumpy I would enable the shock absorbers on my front forks to absorb even more of the unnecessary abuse. With my road bike, I have none of those dampening features, so I feel every nook and cranny in the road; I'm just going to have to get used to that. 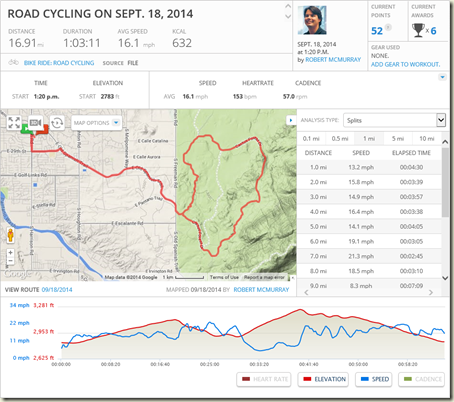 Saturdays are one of my normal long rides, and in keeping with that tradition I rode 63.3 miles, or 101.9 kilometers. This was my second or third time riding more than 60 miles within the past year, although I was in better shape on this ride than my last. That being said, today's ride was a little slower than normal for me; my average mph and cadence were both less than normal, although I'm not sure why. 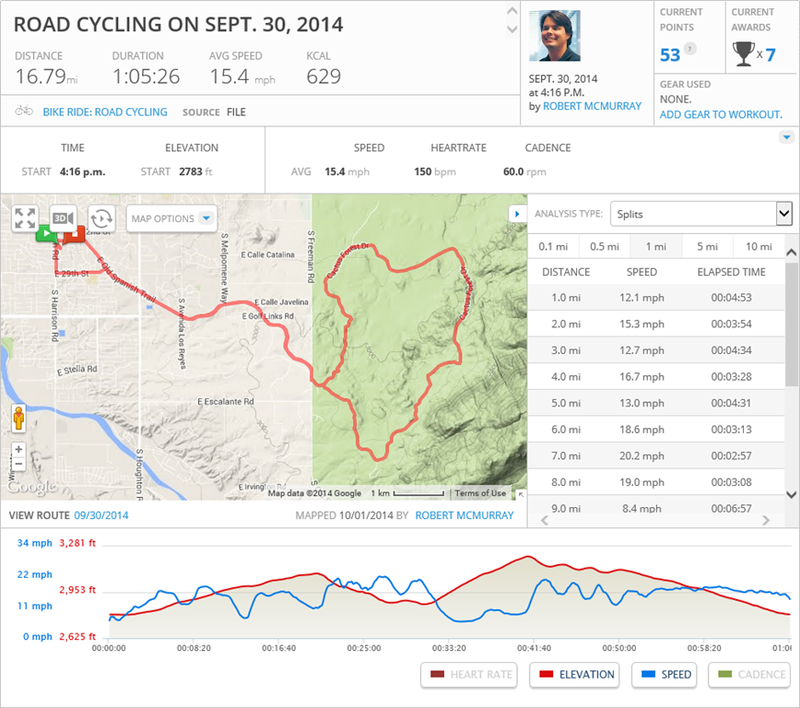 I had planned on riding a double pass around the Pistol Hill Road loop, which would give me somewhere over 50 miles, but here's the way that everything actually panned out: I completed my first pass around the loop, and I made my obligatory stop and the hydration station near the entrance to Saguaro National Park. (By this time I had ridden a little over 27 miles.) While I was refilling my water bottles, I was contemplating whether I should ride the 8-mile loop around the park after my second pass of the Pistol Hill Road loop, but I hate doing that because my legs are pretty tired after 45 or 50 miles and I don't like facing the big hill on the back side of the park when I'm in that condition. Then I had an epiphany: "Why don't I ride around the park now and then make my second pass around the Pistol Hill Road loop?" This seemed like a good idea, and I was in considerably better condition for the park loop, but the long 7-mile ride to the summit on Pistol Hill Road was a pain. The temperature was pretty nice for today's ride. 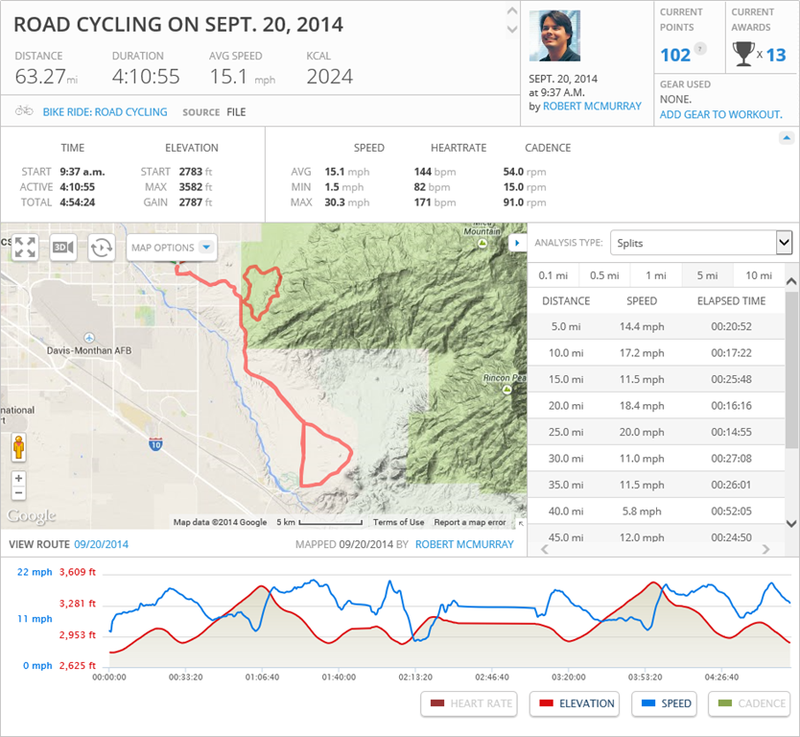 I have done several rides in 100F+ temperatures, so it was nice to have a ride that stayed around the mid-80s. 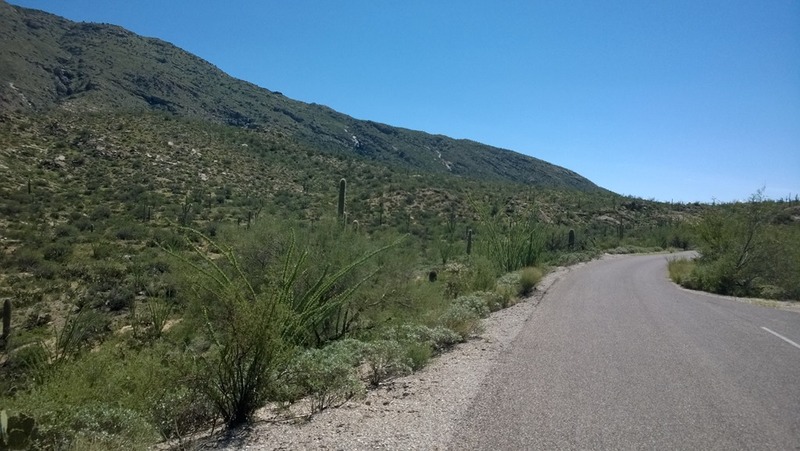 That being said, for some inexplicable reason the temperature spiked all the way to 98.6 while I was riding around Saguaro National Park, which made the loop a little miserable at times. However, the temperature dropped back down to 90 degrees by the time I left the park. Gorn battle, but it would be a good substitute. 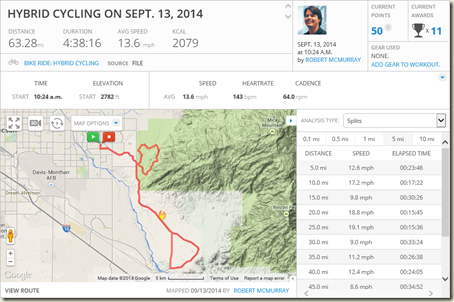 Something weird happened on my way around the Saguaro National Park loop – I inhaled a bug. That might seem kind of funny in hindsight, but believe me – it was no fun at the time. I was coughing violently for at least a mile, and at several random intervals my condition triggered my gag reflex and I thought that I was going to choke. The thought running through my mind at the time was, "Oh great – I'm in the middle of nowhere and there's no one to do the Heimlich Maneuver for me." Eventually I simply screamed at the top of my lungs for several seconds and that seemed to clear my airway, but that was a terrible experience which I hope not to repeat. Panorama from the high point on Pistol Hill Road. Today was also an eye-opener with regard to keeping my electrolytes in balance and my energy up. I carb-loaded before the ride on ¾ of a waffle, and I carried plenty of Gatorade & PowerAde as well as several packets of Gu for the ride. It is suggested that cyclists ingest a packet of Gu about every 45 minutes or so, although I usually don't that often. I had a packet around the 15-mile mark, and another around the 27-mile mark, but sometime around the 42-mile mark I realized that my body had already burned off everything that I had consumed that day and my strength was starting to fade. I quickly downed another packet of Gu, and within a mile or so I had recovered. Today was supposed to be a "Long Day," but it was a rather short long day; even though that's kind of an oxymoron. 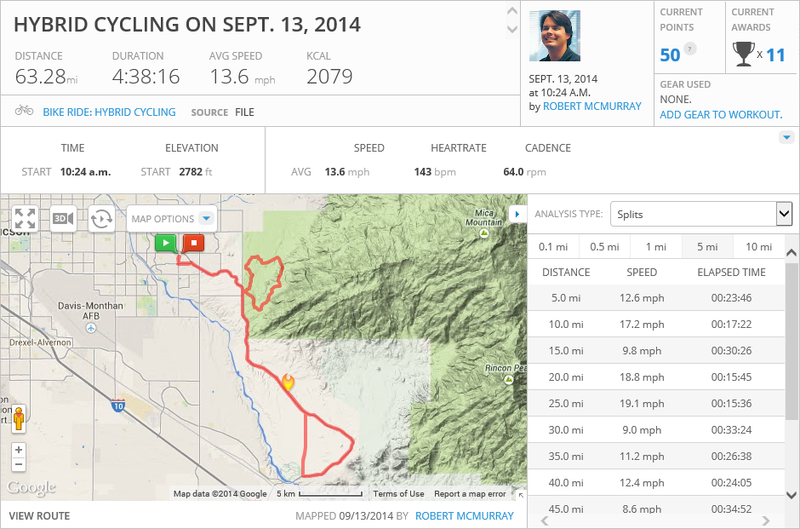 Let me explain: last night I rode 17 miles, which was not one of my normally-scheduled rides. I usually do short rides of 15-30 miles on Tuesdays and Thursdays, and I do longer rides of 40 or more miles on Saturdays. With this schedule in place, I do not ride on the day before a long ride, so my legs feel refreshed by Saturday morning when I head out. That being said, as I got on the road this morning I could feel residual fatigue from my ride the night before, so I could tell that I wasn't riding at my best. In addition, a major storm system was headed my way, and I could see it rapidly approaching on the horizon. With both of those factors in mind, I made up my mind fairly early in the ride to do a single pass around the Pistol Hill Loop Road and call it a day. 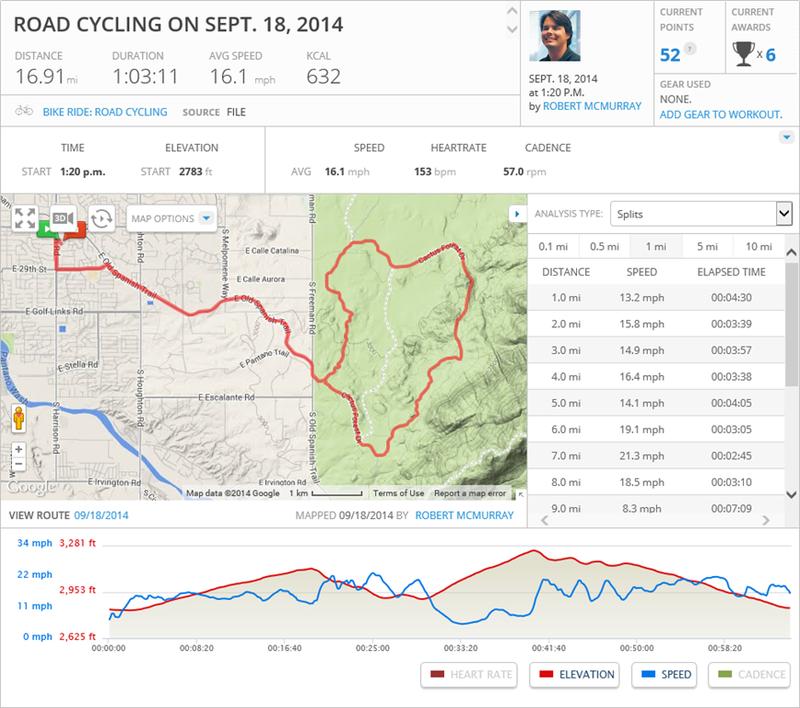 That route is a little over a metric half-century, and that was fine by me. 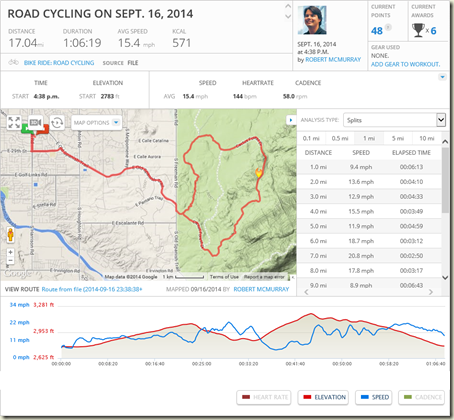 Apart from all of that, I am really learning to like my Garmin 510 that I am now using to track my rides. I've set up the screen to track my cadence, heart rate, current speed, total distance, etc., so at any moment I can get a pretty decent idea of how my ride is going. I have been trying to keep an average of 70rpm for my riding cadence, and I managed to hit that average for today's ride.